The universe of discourse may be the actual universe or a fictional one, one in the future, or in some belief. John is an employee of the ACTME company. All employees of ACTME earn more than £ 25,000. All employees of ACTME know that they should have a good lifestyle. John doesn't think that he has a good lifestyle. Everybody who knows that he should have a good lifestyle and does not think that he has a good lifestyle is disappointed. That is, data is a special case of knowledge. John is married to Sally. John works for the ACTME company. The average salary of ACTME is £ 30.000. Very expressive, probably everything that can be expressed symbolically can be expressed in natural language (pictures, content of art, emotions are often hard to express). Natural language is often ambiguous. Syntax and semantics are not fully understood. There is little uniformity in the structure of sentences. Correct: "When they left the theatre it was pouring, hence they remembered that they forget the umbrella in the cloakroom." Incorrect: "When they left the cinema the moon was shining, hence they remembered that they forget the umbrella in the cloakroom." 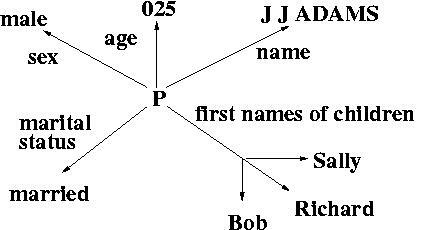 Correct: "marital_status(J J ADAMS) is married"
Incorrect: "marital_status(J J ADAMS) is divorced"
only simple aspects of some universe of discourse. We can represent entities and relationships between entities, but not much more. Allows to structure the knowledge to reflect the structure of that part of the universe which is being represented. Notion explained up to now quite general, for a useful tool, must be much refined. In particular clear syntax, but clear semantics has to be worked out. Frames: A frame consists of a collection of slots which can be filled by values or pointers to other frames. Must be bought and gift-wrapped. Games: Hide and seek. Pin tail on donkey. "It seems to me that the ingredients of most theories [...] have been on the whole too minute, local, and unstructured to account [...] common-sense thought"
"When one encounters a new situation [...], one selects from memory a structure called a frame. This is a remembered framework to be adapted to fit reality by changing details as necessary. 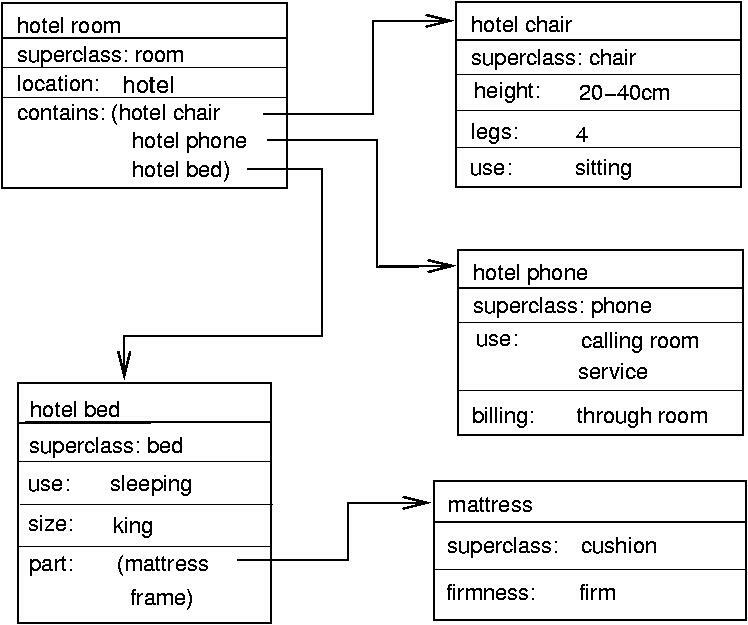 A frame is a data-structure for representing a stereotyped situation, like [...] going to a child's birthday party. Attached to each frame are several kinds of information. Some of this information is about how to use the frame. Some is about what one can expect to happen next. Some is about what to do if these expectations are not confirmed." Frames - What and Why? A Frame is a collection of questions to be asked about a hypothetical situation: it specifies issues to be raised and methods to be used in dealing with them. Consider conceptional object like a view of a cube as a composed object with relations. 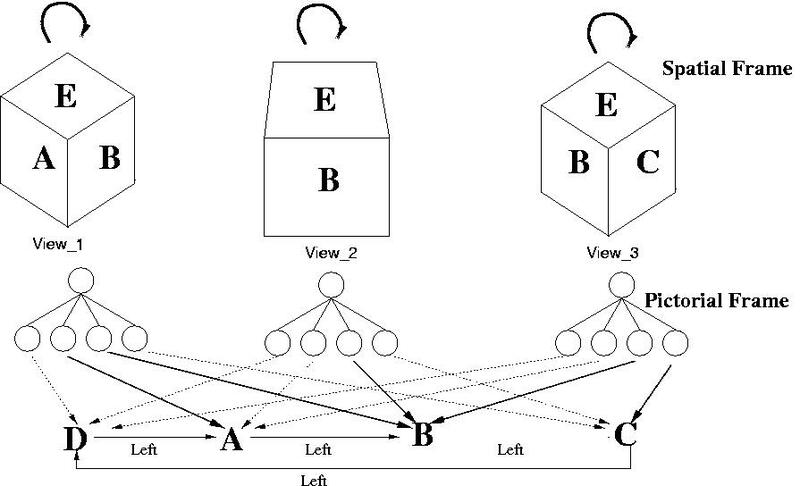 General problem to balance the expressiveness of a knowledge representation formalism and the efficiency to manipulate the represented knowledge. Idea of frames: structure the knowledge, this means also restricting the expressive power in some parts, and extending in others. In order to increase expressive power: procedural attachment, i.e. allow functions to be written in a programming language to be stored instead of the value of some slot. Instead of writing explicit values, the values of the slots area, circumference (as well as breadth in the case of square) are calculated by need. Consider update of length from 5cm to 6cm! That is, extend frames by explicitly representing expectations of actions and state changes. Find primitives to describe the world like PTRANS for "transfer physical location of an object (= go)" and ATRANS for "transfer a relationship (= give)". 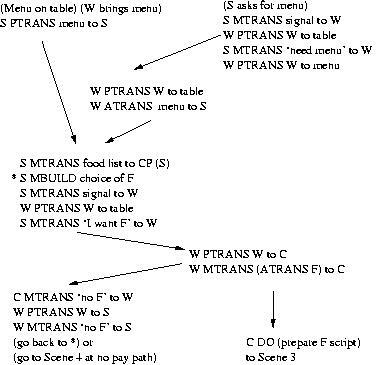 Different scripts for different types of restaurants. Script greatly reduces search in a particular context. The human information processor is a stored program device, with its knowledge of the world \em embedded in the programs. What a person (or a robot) knows about the English language, the game of chess, or the physical properties of his world is coextensive with his set of programs for operating with it. Understandability, learnability, accessibility, communicability, flexibility, economy of storage. They make the important objects and relations explicit: you can see what's going on at a glance. They expose natural constraints: you can express the way one object or relation influences another. They bring objects and relations together: You can see all you need to see at one time. They suppress irrelevant detail: You can keep rarely used details out of sight, but still get to them when necessary. They are transparent: You can understand what is being said. They are complete: You can say all that needs to be said. They are concise: You can say what you need to say efficiently. They are fast: You can store and retrieve information rapidly. They are computable: You can create them with an existing procedure. A lexical part that determines which symbols are allowed in the representation's vocabulary. A structural part that describes constraints on how the symbols can be arranged. A procedural part that specifies access procedures that enable you to create descriptions, modify them, and to answer questions using them. 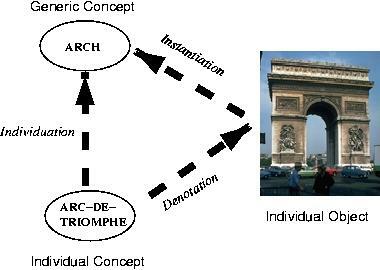 A semantic part that establishes a way of associating meaning with the description. 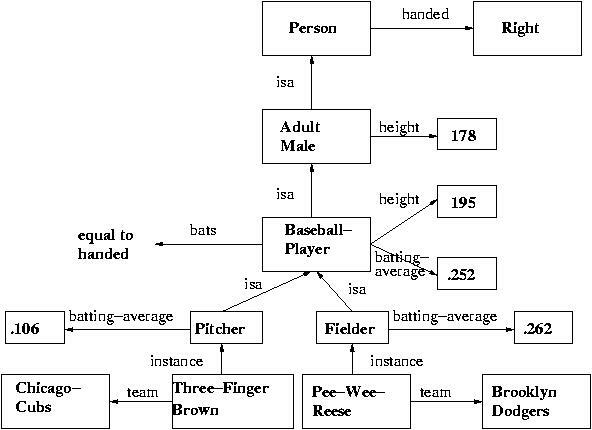 Equivalence semantics: Let there be some way of relating descriptions in the representation to descriptions in some other representation that already has an accepted semantics. 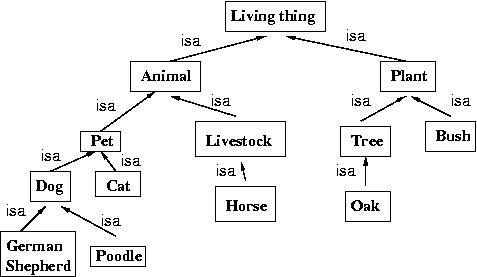 Procedural semantics: Let there be a set of programs that operate on descriptions in the representation. That is, the meaning is defined by what the programs do. Descriptive semantics: Let there be explanations of what descriptions mean in terms we understand intuitively. "isa" corresponds mathematically to the subset relation, " subset "
"instance" corresponds math. to the membership relation, " in "
There is no single most adequate knowledge representation formalism for everything. main points for selecting a representation formalism: what should be represented, how should the knowledge be processed. R.A. Frost: Introduction to Knowledge Base Systems, Collins, 1986. George F. Luger: Computation & Intelligence, MIT Press, 1995. Part Two - Knowledge Representation, p.123-362. Douglas B. Lenat and R.V. Guha: Building Large Knowledge-Based Systems, Addison-Wesley, 1990. Ronald J. Brachman and Hector J. Levesque, eds. : Readings in Knowledge Representation, Morgan Kaufmann, 1985. The URL of this page is http://www.cs.bham.ac.uk/~mmk/Teaching/AI/Teaching/AI/l6.html.